This easy marinated asparagus recipe comes together in just a few minutes. Balsamic vinegar and garlic add a hefty dose of flavor, sugar mellows it out a bit and red pepper flakes add a nice little kick. Asparagus is one of the sure signs of spring, and around here, signs of spring practically make us giddy. Goodbye, dreary Seattle winter. Hello, sun. So, needless to say, asparagus is gracing our dinner table quite a lot these days. We love it grilled. We love it par-boiled and sauteed with a little garlic and butter, then sprinkled with coarse salt. And we love it served cold after it’s soaked in this incredibly delicious marinade that makes balsamic vinegar lovers swoon. This super-simple recipe is a great make-ahead dish for busy weeknights or parties – it’s ready, just waiting in the fridge, whenever you are. It comes together in less than 10 minutes, then your refrigerator and the marinade do all the work. Perfect! Balsamic vinegar and garlic add a hefty dose of flavor, sugar mellows it out a bit and red pepper flakes add a nice little kick. Happy asparagus eating, and happy spring! Snap off the tough ends of asparagus and wash asparagus thoroughly. Cook asparagus in boiling water for about two minutes, until it’s bright green and just beginning to get tender. Drain. Place asparagus in a large bowl of ice water to stop the cooking. Drain. 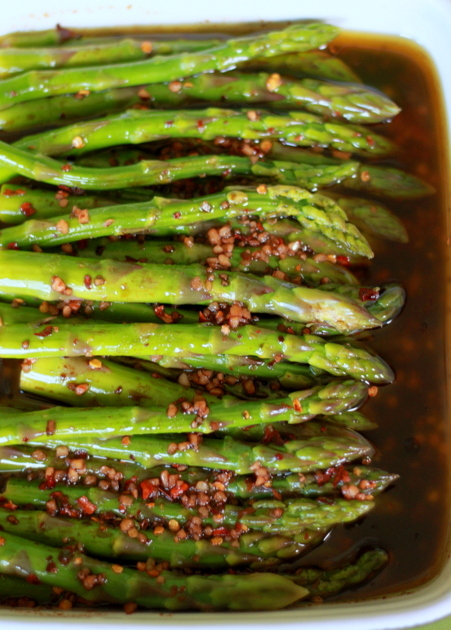 Lay asparagus in a 13″ by 9″ baking dish. In a small bowl, whisk together the olive oil, balsamic vinegar, sugar, garlic, and red pepper flakes. Cover dish with plastic wrap and place in the refrigerator. Chill for about 8 hours. 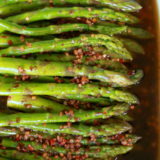 Using tongs, remove asparagus from marinade and serve. My grandpa used to eat his green beans this way, it’s delicious! I can’t wait to try it with asparagus. This sounds fantastic! I can’t wait to try it! Thanks! 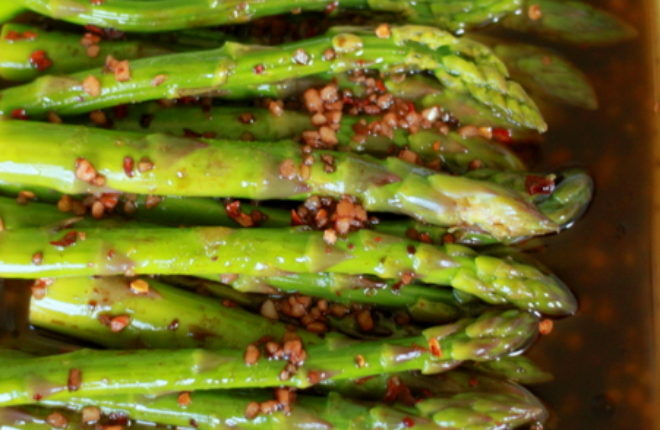 I just roasted some asparagus tonight, but will have to make a vinaigrette next time…this sounds fabulous!!! You may not even need to cook the asparagus. Try it raw. You will be pleasantly surprised. Sounds good except I’m going to wrap in bacon and bake after it’s marinated overnight. Can’t wait! I am doing that tonight!!! How’d it turn out? I just recently tried asparagus for the first time. I absolutely loved it. How do I eat it without all of the after effects?? When I was catering in east texas back in 2006 we used almost exactly the same recipe and technique in batch/bulk for catering parties…we also started making the marinade with orange oil and zest, then garnish the dish with oranges and squeeze a little over the top…flavors where wonderful! Didnt like Mich too strong and raw garlic was not a hit with my guests. Cannot recommend. Love this as a great use for cold asparagus ? Made on 12/24/17. So easy and so good. It was a big hit at my family’s 7-fishes dinner. 2 minutes in RAPIDLY BOILING WATER is enough, despite what you might think. Make sure to plunge asparagus into an ice bath right after draining. I’ll be making this over and over. Delicious, and did I say easy? Can this marinated asparagus remain in refrigerator for 24 hours or longer? Yes, up to a couple of days!